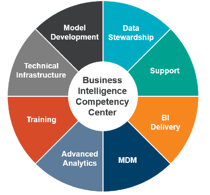 What is a Business Intelligence Competency Center (BICC)? The objective of these centers varies somewhat from client to client, but they are typically designed to provide the organization with better control over operational and financial reporting, reduce costs of this reporting, improve consistency, and provide the organization with more complete information for management decisions. BICCs are often business-led cross-functional teams that provide organizational support and guidance for implementation and usage of business intelligence processes and technology. They can live within the IT organization, but more often are business driven. BICCs come in many different shapes and sizes, based on the individual needs of different organizations. They can be formalized organizations within either the business or IT function, or they can be virtualized teams that offer support. The unifying element of BICCs is that they are designed to help foster business intelligence concepts, applications and their usage within organizations. To learn more, download KnowledgeLeader’s Business Intelligence Competency Center Guide.